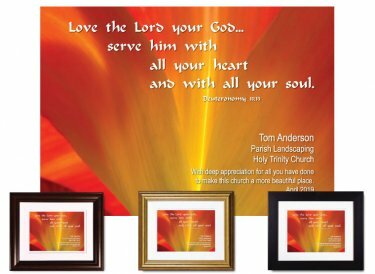 Unique service appreciation plaque features a beautiful macro image of the petals of a day lily paired with this selection from Scripture: Love the Lord your God...serve him with all your heart and with all your soul. Personalize with the recipient's name, job title, church or organization name, and a special message. Framed & Finished - Printed on premium paper with archival inks and double-matted with conservation-grade matboard; mounted using acid-free foam core backing; framed using distortion-free UV acrylic glazing. A protective dust cover and wall guards are applied to the back. Your choice of walnut, gold, or black wood frame (view frames here); ready to hang. Finished size: 10"x12"